The latest in the high voltage range offering enhanced flexibility over the choice of cables, entries and cable terminations. 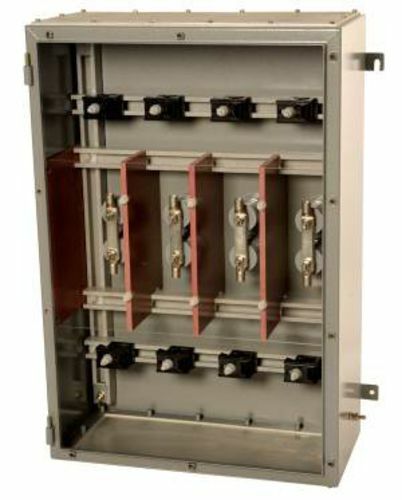 The HVJB can accept up to 4 phase connections either straight through or bottom entry only. The unit can accommodate up to three connectors per phase. The HVJB range is suitable for up to 11kV and 980A and features a 45kA for one second fault rating. The HVJB is fully ATEX and IECEx compliant, suitable for Zone 1 & 2 Gas and Dust environments. The range is also Class I Division 2 and GOST-R certified. There is also a 15kV restricted breathing option (ATEX only). The standard HVJB enclosure is manufactured from 316L stainless steel (EN 1.4404) with a silicon gasket and stainless steel fasteners. The enclosure also features heavy duty machined hinges with lift off cover pad-lockable cover. It has an orbital finish but painted and electro-polished options also available. The IP66/67 enclosure is also DTS-01 deluge and Type 4X tested. Its wide ambient range also makes it ideally suited for low temperature applications.